The Toronto Real Estate Board's latest stats didn't do much to calm the nerves of hesitant homebuyers. Surging listings and double-digit sales declines have a tendency to do that. But, prospective purchasers, this may be the perfect window of opportunity for you to be out there looking for your next home. The Toronto Real Estate Board's latest stats didn't do much to calm the nerves of hesitant homebuyers. Surging listings and double-digit sales declines have a tendency to do that. But, prospective purchasers, this may be the perfect window of opportunity for you to be out there looking for your next home. "Get out and buy," Christopher Alexander, regional director, ReMax Integra, Ontario-Atlantic Canada, told YPNextHome. "You have a lot more to choose from. You don't have as much competition and you can make a more thoughtful decision when it comes to purchasing." At least until the end of July. But let's come back to that. TREB announced on June 5 that sales in the GTA fell 20.3 per cent in May 2017, compared to the same month last year. Sales of detached homes were down by 26.3 per cent; condos were down 6.4 per cent. The supply of listings was up strongly over the same period. Active listings -- the number of properties available for sale -- at the end of May were up by 42.9 per cent compared to the record low a year earlier. "Homebuyers definitely benefited from a better supplied market in May, both in comparison to the same time last year and to the first four months of 2017," says TREB President Larry Cerqua. Even though active listings showed a robust increase, inventory levels remain low. "At the end of May, we had less than two months of inventory. This is why we continued to see very strong annual rates of price growth, albeit lower than the peak growth rates earlier this year," says Cerqua. 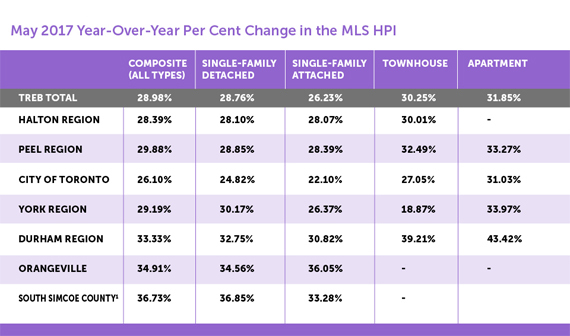 The MLS HPI Composite Benchmark price was up by 29 per cent year-over-year in May. The average selling price for all home types combined for the TREB Market Area as a whole was up by 14.9 per cent to $863,910. "More inventory, meaning more choice and a more educated buyer." "The actual, or normalized, effect of the Ontario Fair Housing Plan remains to be seen," adds Jason Mercer, TREB's director of market analysis. "In the past, some housing policy changes have initially led to an overreaction on the part of homeowners and buyers, which later balanced out. The increase in active listings suggests that homeowners, after a protracted delay, are starting to react to the strong price growth we've experienced over the past year by listing their home for sale to take advantage of these equity gains." For buyers, this means choice. "More inventory, meaning more choice and a more educated buyer," says Alexander. "People have more caution right now after the Ontario Fair Housing Plan was announced; they don't want to jump in and pay too high a price when there is a lot of discussion around the government trying to cool the market. The activity we saw in Q1 was not sustainable - while things may have slowed a bit, there is still a lot of activity happening in the market, and it is still a very healthy market." While price growth in the GTA from May 2016 to May 2017 topped 14 per cent, with average prices surging from $752,100 to $863,910, the pause in sales may slow price gains to between six and 12 per cent. "Still healthy appreciation," says Alexander. As for the real effect of the Ontario Fair Housing Plan, Alexander says we may start to see it by end of July, after three months of market activity since the plan was unveiled. "I don't think it will have a significant impact overall, but it may hurt the speculators' market more than anyone, which is what the tax was designed to do," he says. "There may be pockets across the GTA where you will see these effects more drastically, but those are yet to be determined based on the regulations at this point." Sellers should understand there is still very healthy price appreciation in the market, depending on when you bought. "Most importantly, consult a professional to price your home appropriately, as it is not the same market as a couple months ago," says Alexander.